SSC Stenographer Notification 2017 – Latest Grade C, D Vacancy: SSC Steno Group C & D 2017 Notification released on 19th June 2017. 12th passed Candidates can fill SSC Stenographer 2017 Application form till 15th July 2017 at 5.00 PM. Staff Selection Commission has made the Notification of SSC Stenographer Recruitment 2017 available to all candidates at www.ssc.nic.in. Aspirants who wish to take the SSC Steno Grade C & D Recruitment 2017 Exam in coming days have to apply from this point of time. 19/06/2017 Update – SSC Steno 2017 Notification issued. So the candidates can check complete details of SSC Stenographer Recruitment 2017 through this article. Everything is set ready to conduct the SSC Stenographer 2017 Exam!!! The Staff Selection Commission is going to release the official SSC Steno Grade C D Recruitment 2017 Notification at www.ssc.nic.in. Steno Group ‘C’ & ‘D’ 2017 Notification is set to release on 17th June. Therefore, 12th Passed Job Aspirants are advised to read the Latest SSC Recruitment Notification 2017 for Stenographer posts. To apply for the SSC Stenographer 2017 exam, the candidates have to obey the age criteria. Individuals whose age lie between 18 to 27 years are perfectly eligible to fill the application form. 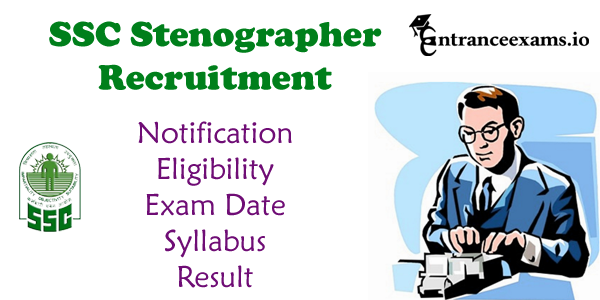 Learn more about the Staff Selection Commission Stenographer Recruitment 2017 Eligibility Criteria from the following sections. Candidates who wish to apply for the SSC Steno Group ‘C’ & ‘D’ Recruitment 2017 have to stay on this page for some time to attain the eligibility criteria. Moreover, on this page, we have updated the SSC Stenographer Vacancy 2017 (Estimated). Willing individuals for SSC Steno Grade C & D Jobs 2017 can grab this good opportunity to work with the Staff selection commission. All readers are advised to read the official SSC Stenographer Notification 2017 before filling the application Form. Till now, there is no official confirmation about the Steno Grade C & D Vacancy details. But, very soon, we will update the ssc.nic.in SSC Stenographer Vacancy 2017 here. Keeping all these eligibility criteria apart, let us have a look at the SSC Stenographer Selection Process 2017. The Staff Selection Commission will filter the eminent and passionate individuals for the SSC Steno Grade C, D Posts on the basis of their performance in the Computer Based test and skill test. Selected aspirants in the SSC Recruitment 2017 Process will receive the good package as per the Indian government norms and regulations. 12th/ 10+2 Qualified individuals from the recognized board are eligible to apply for the SSC Stenographer 2017 Recruitment 2017. First of all, Visit the SSC portal that is ssc.nic.in. Now, Click on the Registration Tab. Fill the OTR (One Time Registration) Form carefully without any mistakes. Enter all the personal details, professional, basic details and click on the submit button. Now, upload your scanned photograph, signature, and the certificate. After the completion of the registration, you will get registration ID and password on your phone. If you registered earlier, then there is no need to fill the OTR form. Just log in with your registration ID and password. Now, Click on the apply button and download the SSC Stenographer Recruitment 2017 official Notification. Read the official SSC Steno notification carefully. Fill the application form with relevant details and upload the required documents. You have to pay the application fee through online mode. Recheck the details entered and click on “Submit” Button. Save the copy of the application form for the further reference. Individuals can check out the SSC Steno Grade C, D Exam Syllabus & Exam Pattern here. In order to start the preparation, One should have the knowledge of Study Materials. This helps the individuals to perform better in the Staff Selection Commission Steno Exam 2017. Here is the simplest way to Download SSC Stenographer Previous Question Paper via www.entranceexams.io. Download the SSC Question Papers from the below provided shareable links at a free of cost. In order to take the Staff Selection Commission Exam, the candidate has to carry the SSC Steno Admit Card 2017. Because all the important information regarding the examination will be shown on the hall ticket. NOTE: Also, Visit the official website of Staff Selection Commission ssc.nic.in to download SSC Stenographer Notification 2017.